My goal is to try to stick to participating every other Wednesday. I have unsuccessfully attempted this in the past but I thought I would try again. So here I am. This morning’s desk is filled with one of my new stamp set’s coordinating dies. In the past, I never bought the coordinating dies because they forced me to reach deeper into my wallet and I figured I could just fussy cut the stamped images out when needed. Fast forward to today, and I still hesitate but depending on the complexity of the shapes I will cave and buy the dies. They make the process more efficient and this year I need more efficiency with production. In preparation, I am using my wire cutters to cut out the dies so that I can use them. I tested one out on an image I colored up on my recent crop. My old faithful Cuttlebug is on the left. The postcard in the middle of the lady reading and sipping tea is from Russia. To the right, is my first attempt at a new color combination for sunflowers with my Copic markers. The one to the left is watercolored with my new watercolor set from Altenew. My brand new coloring book that arrived yesterday is in my inbox on the far right. Today is a shorter work day because my oldest has a half day so I am working as efficient as possible. So pardon me and I will be sure to visit some desks tomorrow. Next PostHappy Monday: Mums everywhere! Previous PostNational Read an Ebook Day! Hi Belinda. Those flowers are beautifully coloured – obviously a favourite technique of yours – well done. Really pretty flowers wreaths the card looks fabulous, so professional and beautifully coloured. 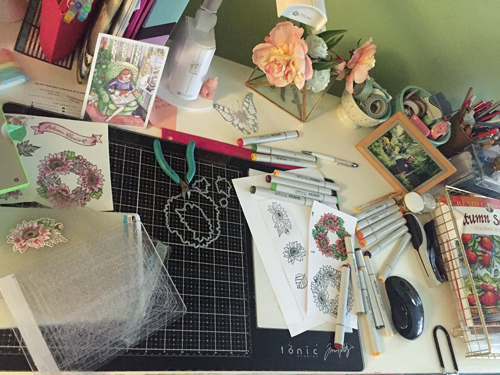 Love how you photographed your desk. I wish I could afford copics, You use then SO well and know exactly how to blend them, too. That is evident with the flower wreaths. Happy WOYWW from # 1.